Some diamonds are much more beautiful, brilliant and fiery than others. Beautiful diamonds have proportions that minimize the amount of light that is lost through the bottom and sides of the stone and maximize the amount of light returned through the top. Beautiful, bright and well cut diamonds are more valuable and more desirable than darker, poorly cut stones. Cut has the greatest influence on the beauty of a diamond. A beautiful diamond is one that at minimum ranks high on all of the following factors of "Cut". 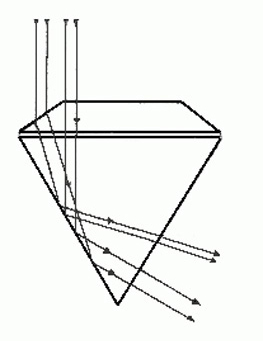 Light Return versus Light Loss: The proportions and angles of the diamond, whereby certain proportions and angles will return more of the light entering the diamond and return it to the eye of an observer. Other proportions/angles will allow light to leak out of the bottom or the sides of the diamond, and less light is returned to the observer. Light Return Geometry: Certain proportions and angles will increase the amount of white light (brilliance) returned and will simultaneously decrease the amount of color flashes (fire). Other proportions will increase the amount of fire and simultaneously decrease the amount of brilliance. Fire and Brilliance have an inverse relationship. Brilliance: The total amount of white light, both external and internal, returned from the diamond to the eye of the observer. Dispersion or Fire: The flashes of color, resulting from the dispersion or separation of white light into its component spectral colors, that is returned from the diamond to the eye of the observer. Scintillation: Sparkles, reflections and flashes of light from the diamond as the stone, observer or light source moves. 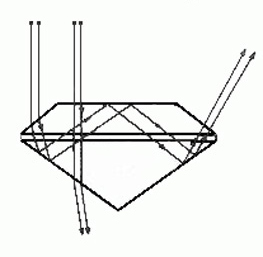 Perceived Symmetry: The overall symmetry of the shape of the diamond. To get a basic understanding consider three different diamonds diamonds. One has a very deep cut, one has a very shallow cut and the third has an "ideal" cut. Both the deep cut and the shallow cut will allow light to leak out the bottom or the sides of the diamond. The "ideal" cut diamond returns light up through the top of the diamond. Light entering a deeply cut diamond will leak out the bottom and sides of the stone. Less light will be returned to the viewer's eye and the diamond will not sparkle as much as possible. 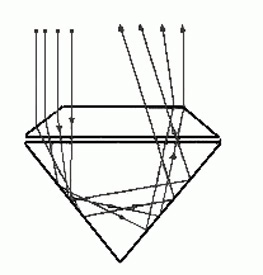 Light entering a shallow cut diamond will leak out the bottom and sides of the stone. Less light will be returned to the viewer's eye and the diamond will not sparkle as much as possible. Light entering an "ideal" cut diamond bounces off the bottom and sides of the stone and returns through the top of the stone. Very little light is leaked and the diamond sparkles. The two most prominent and accurate gemological grading laboratories in the world are GIA (Gemological Institute of America) and AGSL (American Gem Society Laboratories). While their grading of Diamond Color, Diamond Clarity and reporting on the measurements of a diamond are essentially equivalent the two labs have different methodologies with respect to the grading of Diamond Cut. For Round Brilliant Cut Diamonds GIA will issue grades for the Cut Proportions, Polish and Symmetry of a diamond. The five possible cut grades are: Excellent, Very Good, Good, Fair and Poor. GIA will take an average of each of these measurements and assign a grade to each parameter. They also assign a high priority to an assessment of the relationship of the combination of the Table Size % to the Crown Angle and further to the Pavilion Angle. Through rigorous interpolation and extrapolation GIA has generated sets of combinations whereby different Cut Grades would be issued for Round Brilliant Cut Diamonds. The highest GIA grade for the Cut, Polish and Symmetry of a round brilliant cut diamond would be "Excellent, Excellent Excellent Cut" or "Triple Ex" or "3X". GIA does not offer Cut Grades for Fancy Shape Diamonds. The GIA Cut Grading System is still at the core a proportion based system that addresses the averages of certain parameters of a diamond. It is relatively crude or out dated compared to the AGS Cut Grading System. Since its inception in 1996 the AGS Laboratory has always led the way in the assessment of Diamond Cut. The current methodology analyzes the light performance and proportions of a three-dimensional image of the diamond. Instead of working with averages of various parameters as does GIA the AGS performance based cut grading system evaluates the optical effects of all of the facets. Each facet is assessed for shape, size, orientation and tilt. The AGS system grades for three categories: Light Performance, Proportions and Finish. The AGS Cut Grading Scale runs from 0 to 10 with 0 being the best. A robust optical ray tracing software analyzes the effect of each facet in relation to all the other facets and accurately measures Brightness, Dispersion, Leakage and Contrast. Along with these seven more factors are calculated. These seven factors are Durability, Tilt, Weight Ratio, Girdle Thickness, Culet Size, Polish and Symmetry. The performance based American Gem Society cut grading system can be applied to any shape and standardized facet arrangement. The Princess Cut (square modified brilliant), the square step cut, the Emerald Cut (rectangular step cut), the octagonal step cut and the Oval Brilliant are currently included in the AGS Diamond Grading Standards for Cut. The highest AGS grade for the Light Performance, Proportions and Finish for a round brilliant cut diamond, princess cut, square step cut, Emerald Cut, octagonal step cut or Oval Brilliant Cut would be "0, 0 0 Cut" or "Triple 0" or "000". The AGS Cut Grading System is quite sophisticated compared to the GIA system as methods to grade for and filter out the best looking diamonds. The AGS 000 Cut tends to be much tighter in the face up view than the wider range seen with the GIA 3X Cut. That said, there are many GIA 3X that look better than some AGS 000. Our proprietary tool the Diamond Photoscope can distinguish differences between diamonds in situations like this.